How hot do you like your wings? Planning a Super Bowl LII party? 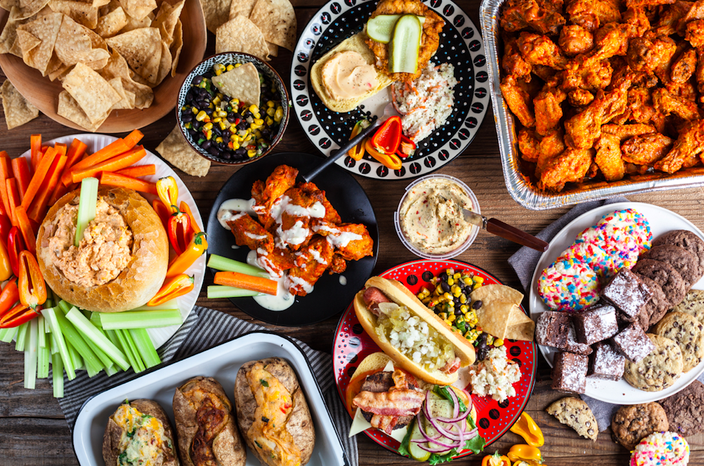 We've rounded up some options to make sure you and your friends won't go hungry watching the Eagles versus the Patriots on Sunday, Feb. 4. Below are game day packages from local hot spots. Order snacks, appetizers, meals and desserts to enjoy while watching the big game. This roundup includes everything from barbecue platters to football-shaped ice cream treats. You could have your Super Bowl LII party catered by Di Bruno Bros. and get all this food. Di Bruno Bros. Catering is offering a game day package that serves 12 for $299. Included is wings, a build-you-own slider kit with all the fixin's, stuffed potatoes, homemade tortilla chips with salsa, a trio of dips and a dessert tray with cookies and brownies. Each item can also be ordered separately. Below is more information about each. To order the package or à la carte, call (215) 665-1659. Orders must be placed by noon on Friday, Feb. 2. • Wings ($89) - Over seven dozen wings served with homemade blue cheese dressing, carrots, celery and sweet peppers. Choose from buffalo, abbruzze or parmesan garlic. • Slider kit ($39) - Choose the all-beef burger, prosciutto-wrapped hot dog or fried chicken kit. Comes with fixin's like bacon, cheeses, spreads, pickles and buns. • Stuffed potatoes ($49) - Choose to order broccoli, cheddar and bacon potatoes, BBQ chicken and cheddar potatoes or beef brisket, gruyère cheese and caramelized onion potatoes. • Chips with salsa ($20) - Pico de gallo and black bean & corn salsa with homemade tortilla chips. • Trio of dips ($69) - Spinach artichoke, caramelized onion, and buffalo chicken dips in sourdough bread bowls. Served with crostini, carrots, celery and sweet peppers. • Dessert tray ($55) - Includes an assortment of sugar rainbow, double chocolate, chocolate chip and oatmeal cookies, as well as Belgian chocolate brownies. All items can be picked up cold from the Rittenhouse, Franklin or Ardmore stores at no extra charge. Re-heating instructions will be provided. If your order is $400 or more, you can choose to have your food delivered hot for $60. Get an ice cream football from Franklin Fountain. 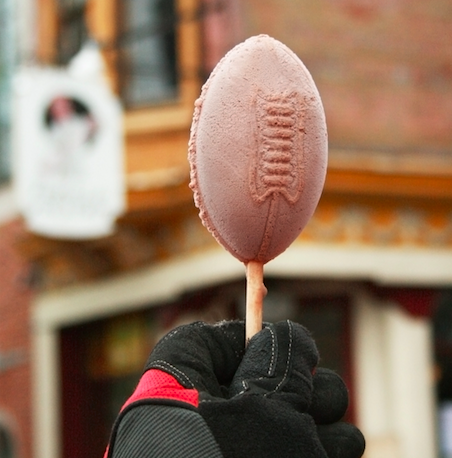 Stop by The Franklin Fountain by Thursday, Feb. 1, to reserve an order of ice cream footballs. The football-shaped ice cream novelties are available in chocolate or green mint chocolate chip. They can also be dipped in house-made chocolate for extra decadence. To pre-order, call (215) 627-1899. The Franklin Fountain is located in Old City at 116 Market St., Philadelphia, PA 19106. For your Super Bowl party, let Kensington Quarters cater. 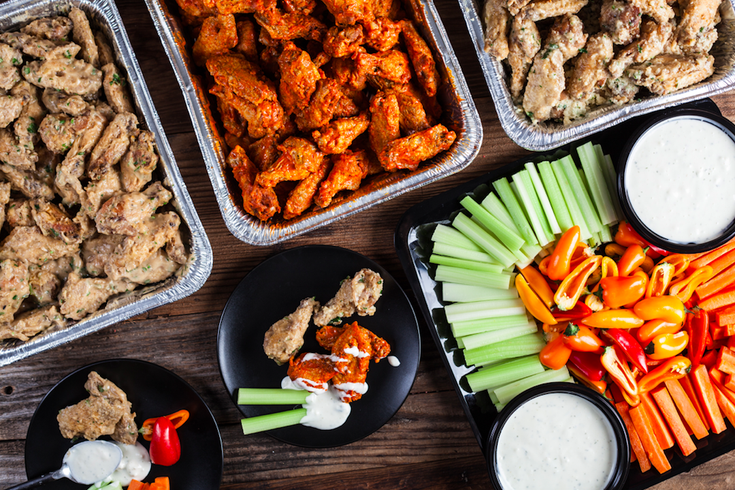 The Super Bowl Party Tray is $65 and serves six to eight people. Included is one pound of house-made sausages, one pound of roasted pork, one pound of brisket, as well as the chef's selection of sides and rolls from Philly Bread. Pre-orders are available until Thursday, Feb. 1. Kensington Quarters is located at 1310 Frankford Ave., Philadelphia, PA 19125. Order a pie to watch the Birds on Super Bowl Sunday. All SliCE locations (Rittenhouse, Fishtown, Italian Market in South Philly and Washington Township in New Jersey) will offer the below specials from Friday, Feb. 3 through Sunday, Feb. 4. 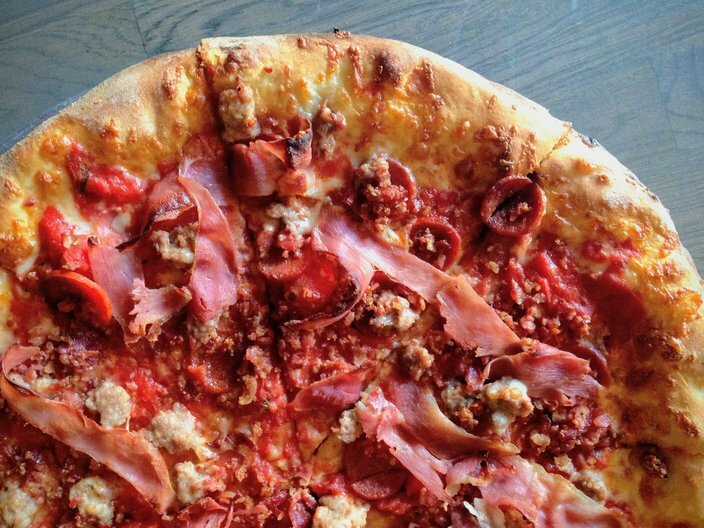 • Eagles' Spicy Meatlovers ($17 small, $23 large) - Includes long hot peppers, Maglio's sausage, pepperoni, prosciutto, bacon and mozzarella. • Truffle Ribeye Touchdown Pizza ($18 small, $25 large) - Includes ribeye steak, mozzarella, mushrooms, caramelized onions, green peppers and white truffle oil. • Vegan Spicy Meat Lovers ($19 small, $27 large) - Includes San Mariano tomato sauce, daiya vegan cheese, vegan sausage, vegan pepperoni and long hot peppers. * Ultimate Eagles Football Pizza ($19 large) - A football-shaped pie topped with San Marzano tomatoes sauce, mozzarella, and pepperoni, then finished with ricotta laces. SliCE is also offering deals, which are listed below. • The Tackle ($35) - Includes 25 twice-cooked wings with choice of sauce, celery and blue cheese, and one large plain pie. • The Field Goal ($55) - Includes 25 twice-cooked wings, celery and blue cheese, 15 mozzarella sticks and one large plain pie. • The Touchdown ($85) - Includes 50 twice-cooked wings, celery and blue cheese, and two large plain pies. • The Turf ($60) - Includes 25 twice-cooked wings, celery and blue cheese, one small Caesar salad and one large plain pie. This barbecue spot offers family style platters, with options for a small get-together to a big bash. • The Butcher’s Block ($95.95 and feeds 4-6) - Includes eight bones baby back ribs, eight bones Memphis-style ribs, half a smoked chicken, half pound of pulled pork and half pound of brisket. Choice of any four fixin's (one pint each). Includes six cornbreads. • The Teaser ($149.95 and feeds 6-8) - Full rack baby back ribs, full rack Memphis-style ribs, whole smoked chicken, one pound of pulled pork and one pound of brisket. Choice of any four fixin's (one and a half pint each). Includes eight cornbreads. • The Beggar’s Banquet ($239.95 and feeds 10-13) - Two full racks baby back ribs, two full racks Memphis-style ribs, two whole smoked chickens, one pound of pulled pork and one pound of brisket. Choice of any four fixin's (two pints each). Includes 13 cornbreads. • The Extravaganza ($359.95 and feeds 15-20) - Three full racks baby back ribs, three full racks Memphis-style ribs, two whole smoked chickens, two pounds of pulled pork and two pounds of brisket. Choice of any four fixin's (three pints each). Includes 20 cornbreads. Baby Blues BBQ is located at 3402 Sansom St., Philadelphia, PA 19104. The phone number is (215) 222-4444. It's a Jägermeister-infused hoagie filled with Philly’s favorite Super Bowl snacks. 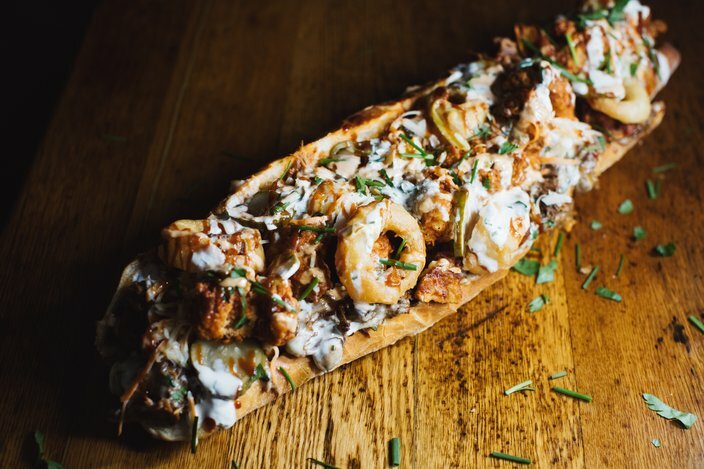 Stockyard Sandwich Co. has created "The JägerMonster," a 30-inch long, Jägermeister-infused hoagie filled with Philly’s favorite Super Bowl snacks. The JägerMonster is available at Stockyard for preorder until Saturday, Feb. 3, for $60. Call (215) 977-9273 to order. Fette Sau is offering two specials for Super Bowl Sunday. All orders must be made by 11 p.m. on Thursday, Feb. 1. Call (215) 391-4888 to place an order. Below are the options. Fette Sau is located at 1208 Frankford Ave., Philadelphia, PA 19125. Get a party tray of sliders and fries delivered to your door from P'unk Burger. For $75, you will receive 25 cheeseburger sliders with condiments and a tray of thin sliced french fries. Must order 24 hours in advance. Call (215) 468-7865. P'unk Burger is located at 1823 E. Passyunk Ave., Philadelphia PA, 19148. Check back for updates, as we add more options for Super Bowl Sunday.